The patient had undergone EVAR for bilateral common iliac artery aneurysm with the original Gore Excluder stent graft a dozen years before with coil embolization and extension to the external iliac on the larger side and femoral to internal iliac artery bypass on the other side. A coagulopathy, one of the clotting factor deficiencies, had made him high risk for bleeding with major open surgery. His aneurysms never shrank but remained stable and without visible endoleak by CT for a long time resulting in ever longer intervals between followup. 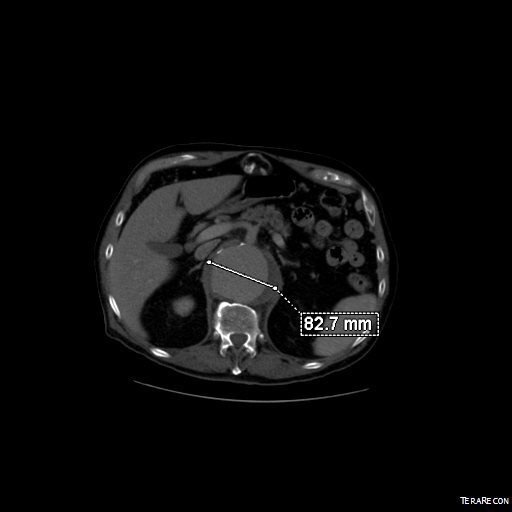 Between 2009 and 2013, there was subtle enlargement on the embolized side without a type I or type III leak, and the patient was brought back a year and a half later, with further growth of the sac. This was a relatively rare type IV endoleak that was causing sac enlargement due to excessive graft porosity of the original Excluder’s graft material. Its treatment is either explantation or relining. 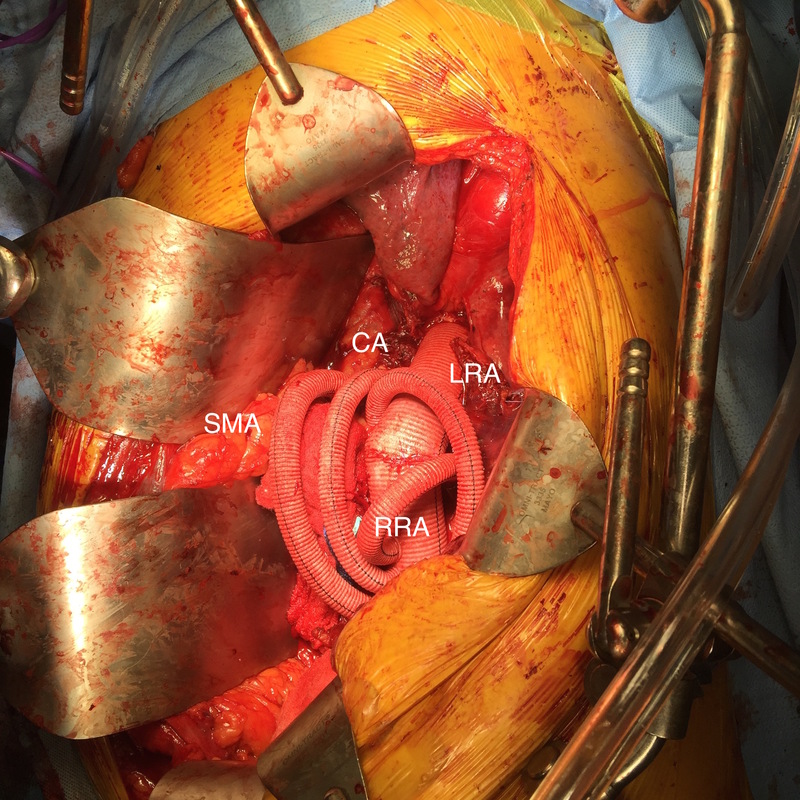 We chose to reline the graft with an Excluder aortic cuff at the top and two Excluder iliac limbs. This was done percutaneously and in short followup, there has been stabilization and even some reduction in the aneurysm circumference. It was long known that a certain percentage of PTFE grafts “back in the day” would sweat ultrafiltrated plasma. The relative porosity of the grafts allowed for transudation of a protein rich fluid. Tanski W, Fillinger M. J Vasc Surg 2007;45(2):243-249. This results in a hygroma formation. I remember seeing this in AV graft fistulae back in the 90’s -after flow was introduced, the grafts would start sweating! The newer grafts are lower porosity and this is seen very infrequently. Drs. Morasch and Makaroun published a paper in 2006 comparing parallel series of patients who received the original Gore Excluder (OGE), the currently available Excluder Low-Permeability Device (ELPD), and the Zenith device (ZEN). Sac enlargement occurred in equal measure between OGE and ZEN but zero was reported for the ELPD. Haider S et al. 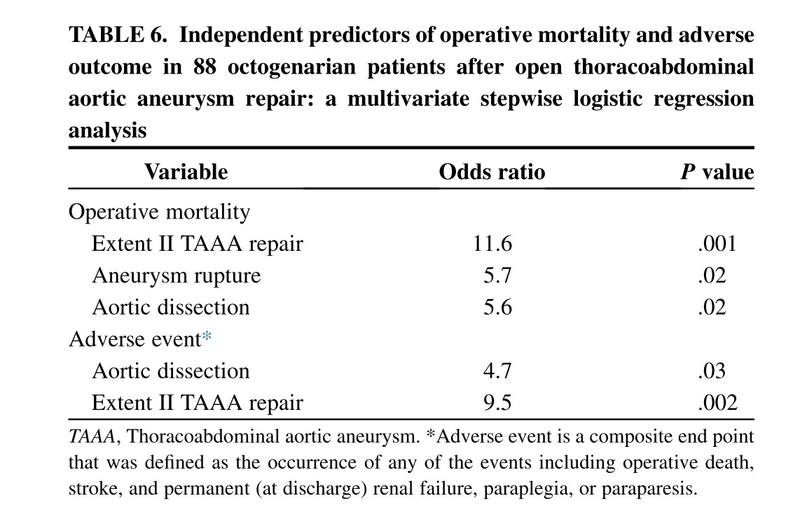 J Vasc Surg 2006;44(4):694-700. 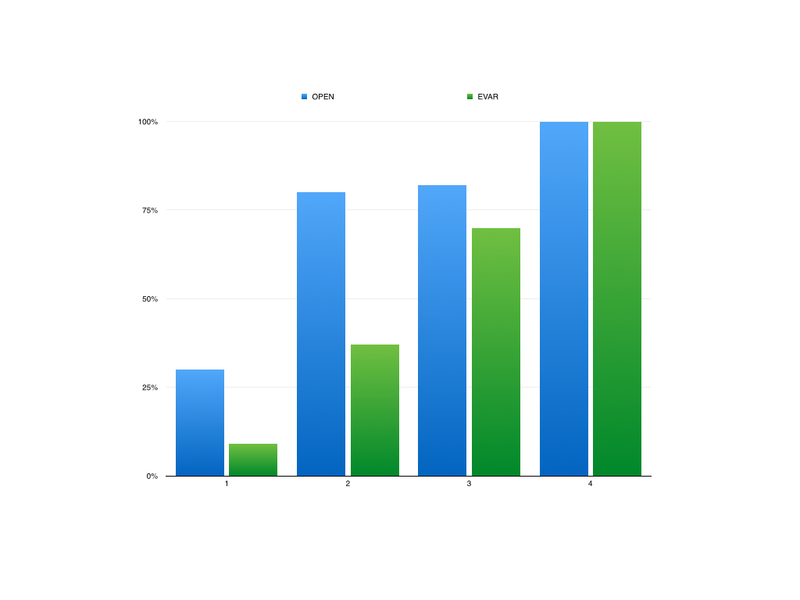 The ELPD had higher rates of sac shrinkage than the OGE, and equal rates of sac shrinkage compared to ZEN. The diagnosis in my patient’s case came about through serial followup through a decade. While I doubt that the aneurysm would have ruptured in the same way as in a Type I, II, or III endoleak, I am sure it would have progressed to developing symptoms from aneurysmal distension or local pelvic compression. Is it possible to visualize this kind of endoleak at the time it is suspected? 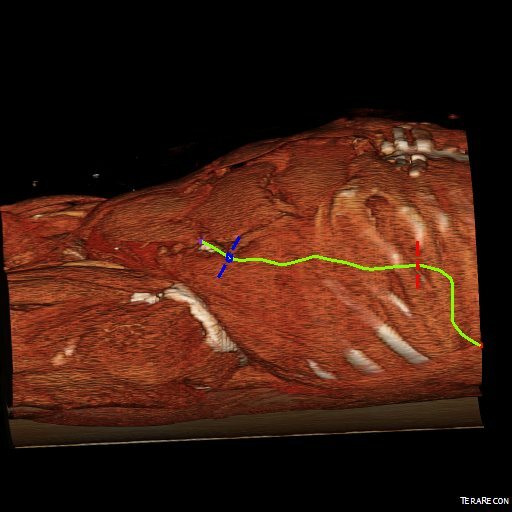 I came across a case series from the Netherlands using Gadofosveset trisodium which takes longer to clear than the usual Gd-based MR contrasts and they successfully visualized transudative leaks in 3 serial patients with the original Excluder graft. Cornelissen SA et al. 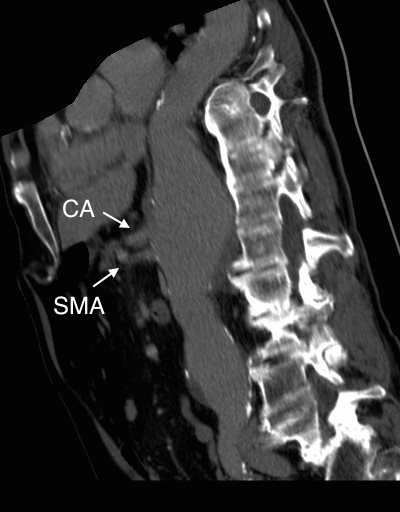 J Vasc Surg 2008;47(4):861-864. The problem is that Gd-based contrasts have toxicity, especially for patients with poor renal function. The protocol is time consuming. And I suspect that ten years out, a lot of grafts will have positive findings, especially cloth based grafts that are sutured to their supporting stents, without clinical basis for treatment as their sacs size are likely stable on a year to year basis. That said, as we are well into the second decade of commercially available stent grafts, it is even more important than ever to continue lifelong followup even for what is assumed stable, patent grafts and anatomy.